4 days from £2291pp plus international flights. 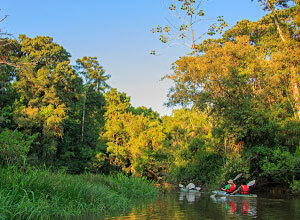 This is your chance to explore upper Napo River, Ecuador's primary Amazon tributary. You have 3 days in this remote and fascinating region, discovering its ecosystems, coming face to face with its wildlife and meeting indigenous peoples, all from the comfort of your own cruise boat. 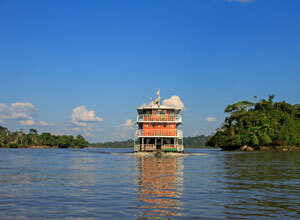 From the moment you board, you'll be immersed in the rich Amazon world, as the boat departs on its downstream cruise. Your guide will brief you on upcoming activities and, wasting no time, on your first evening you'll head out into the forest searching for nocturnal creatures. On subsequent days you'll be paddling through piranha-filled waters by canoe, following walking trails deep into the rainforest, watching as hundreds of parrots gather to eat clay from the riverbanks and spending time with members of a local community. It's a rich and varied holiday, which manages to pack a lot into a relatively short amount of time. In between activities and excursions, you'll have the run of the ship. You can sit and browse through natural history books and chat with other passengers as you enjoy a drink from the bar or enjoy some quiet downtime in your cabin, watching the scenery through the large picture windows. Sun lovers will relish the chance to top up their tans on the sundeck, while others laze in the shade. Meals are sociable affairs with freshly cooked food being served either indoor or out on the deck. 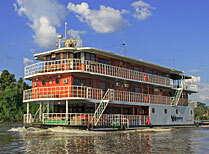 There are 2 boats operating this itinerary, MV Anakonda and MV Manatee. The Anakonda is a luxury vessel and operates the Sunday departures, while Manatee operates the Friday departures. 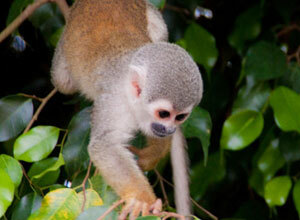 The Anakonda cruise starts from £2765 per person and the Manatee cruise starts from £2291 per person. Please note that the itinerary outlined is quoted as a guide and that, due to technical and operational factors it may need to be altered at short notice. Price notes: 2019 guide price pp sharing on a set departure: Manatee from £2266. Anakonda from £2765. You will need return flights to Quito. As a guide return flights from London to Quito will start from around £900 per person, depending on season and availability. We will be happy to look into flights for you. 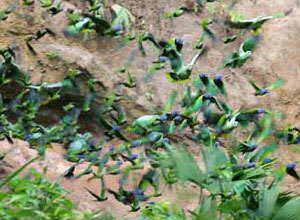 The Yasuni National Park is an important UNESCO Biosphere Reserve and the largest tract of tropical rainforest in Ecuador. Rio Napo is a vast river, flowing from the Andes to the Amazon River and is some 550 miles long. 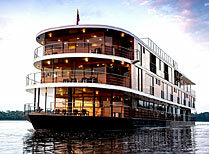 MV Anakonda is a stylish luxury cruise ship, providing ample space and creature comforts while you're in the Amazon. MV Manatee takes you into the Ecuadorian Amazon, revealing its fascinating flora & fauna while enjoying air conditioned accommodation.